Variety of rope colours available. Made with 13mm diameter doublebraid yachting rope. Each rein is six foot long plus tassel and leather end. This rope is ideal for reins, being tough and strong but feeling lovely and soft in the hands. 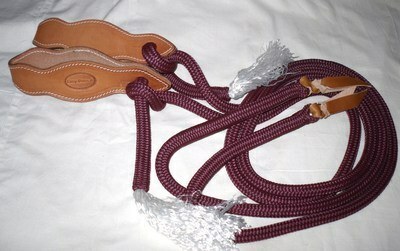 Tassels at the slobber strap ends and soft leather at the riders end. The slobber straps are made from a quality leather which has been oiled and stitched. The stitching is not only decorative but stops the leather from stretching. The leather is a good weight and each slobber strap is almost 8.5" long when folded. The widest point is 2.25" and the narrowest, where the slobber strap folds over the bit is 1". This is a superb item that will last for years. The leather darkening with each oiling. Please note that the slobber straps no longer have the logo as in the photo. As an alternative you can have them plain, or with metal conchos of either stars, horseshoes, or a running horse. If choosing the running horse the nearside slobber strap will have the horse facing the rider and the offside one facing away.